Due to the government shutdown, National Park Service police put up barriers preventing access. According to Leo Shane III, White House and Veterans Affairs reporter for Stars and Stripes, the veterans knocked over those barriers. Putting up barriers around open outdoor monuments was dumb shutdown theater and they deserve to have it backfire on them. 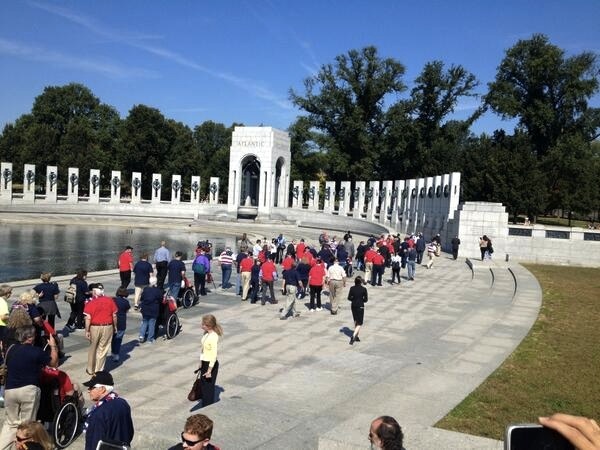 In short: the WH went out of their way to barricade an outdoor WWII memorial to WWII vets as a political stunt. Utterly obscene. All of which raises some hope that, despite Republican errors, the Democrats may overplay their hand. Many elderly veterans, some in wheelchairs, broke through the barriers set up around the memorial, as police, park service employees, and tourists looked on. “The Germans and the Japanese couldn’t contain us. They weren’t going to let barriers contain them today. They wanted to see their memorial,” says Armstrong. And that woman is classified as an “essential” federal employee! Maybe some more layoffs are in order.